Come Join the Jamboree! Grab your dancin' shoes and your singin' voices and come on in!! Picasso, That's Who! (And So Can You!) Wins Parents' Choice Gold Award Award and NAPPA Gold Award!! Cousins Jamboree is a Winner of a Parents' Choice Silver Honor Award!!! Picasso, That's Who! (And So Can You!) new album coming May 22! Hop a train with Romare Bearden! Action paint like Jackson Pollock! Take a line for a walk with Paul Klee! Jump off the diving board into a painting by David Hockney! Look closely at the petails of a flower like Georgia O'Keeffe! These and other theatrical, musical adventures await! 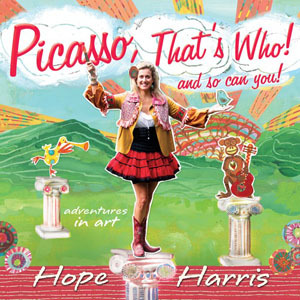 Hot on the heels of her 2011 Parents' Choice® Silver Honor Award winning CD, Cousins Jamboree, Hope is excited to embark on this lively new adventure into the world of art with the May 22 release of Picasso, That's who (And So Can You!). The album takes kids and families through a tuneful clelbration of 19th and 20th century visual artists, offering musical mini-lessons in art appreciation and encouraging listeners to pick up a brush or a crayon and try creating art!